I am not done with my “zoodle” maker. 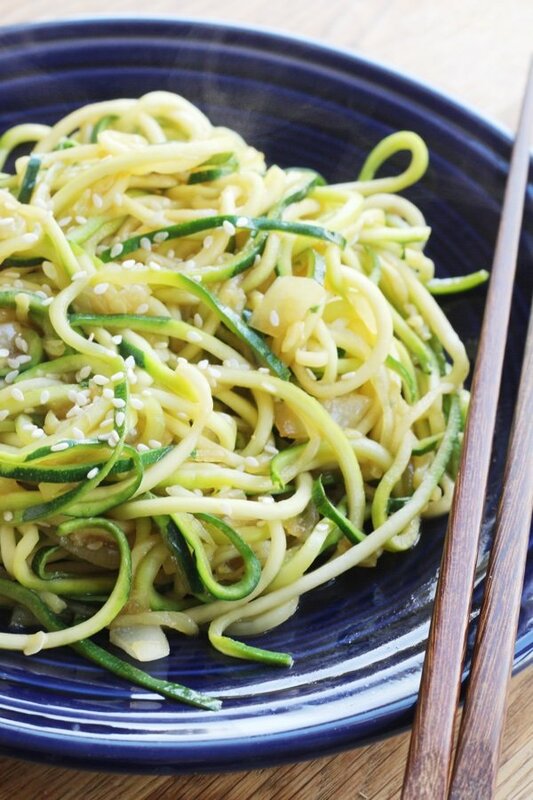 I love stir fry zucchini noodles! They are kind of like lo mein except a fraction of the calories and packed with vegetables. Back in January, I wrote how to make zoodles and then I tried my hand at butternut squash noodles. I noticed that at my local Stop & Shop, they sell zoodles! Check in the produce section next to the sliced mushrooms. You don’t even need a zoodle maker to create this recipe. My 12 year old daughter would be sad if we couldn’t make our own because she loves turning the crank and “making” the noodles. It is a perfect job for a bored child. I attempted to spiralize the onions as well as the zucchini but it didn’t go well. I ended up sobbing with a small pile of shredded onion. I found it much easier to slice the onions and I cried less. This recipe is simple and you could add some chicken, pork, beef, or tofu to make it more substantial. Think of it as a palette for your favorite additions and you don’t need rice as a side (since this is supposed to be a noodle replacement). 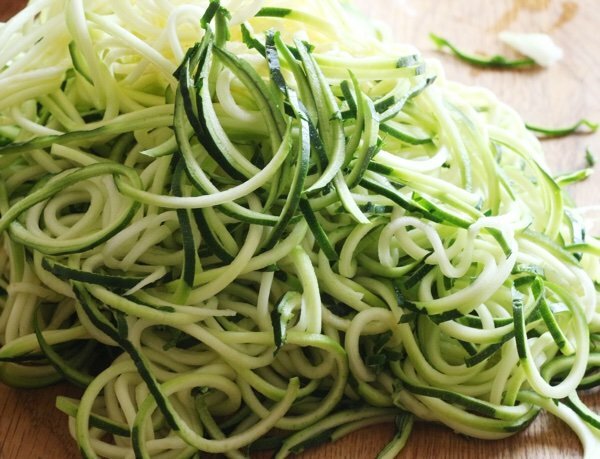 I think spiralizing vegetables is a great way to dress them up without a lot of work. The process changes the texture of them so they are different. I am always looking for new ways for the same food so I don’t get stuck in a food rut. I want to try spiralizing beets because I hear beet noodles are delicious. Perhaps I could convince all the beet haters out there to love beets! You can also buy beet noodles at my local store. What is your favorite way to cook and serve zoodles? Heat oil over high heat in a large frying pan or wok. Saute onions until softened (about 3 minutes) and add zucchini noodles. Cook for 4 minutes until softened. Add soy sauce, teriyaki sauce, and sesame seeds and serve immediately. I love zoodles! I spiralize a batch and keep them in a baggie in the fridge. They keep for several days. I always put a paper towel in the bottom and leave bag open so they don't get soggy. A good way to introduce them to the family is to add some spaghetti pasta on top of zoodles when serving. My husband loves them that way. I love zoodles too! I make a lot of curry dishes. Instead of serving over rice, I make zoodles. The texture is great. I don't feel like I am missing the rice at all. Made some last night to have with meatballs and sauce. Everyone else had spaghetti. Love me some zoodles! I spiralized 2 this morning to cook for my dinner tonight. When you have fresh basil, give this a try - spray a pan with olive oil, add a teaspoon minced garlic, half of an onion, and a pinch of red pepper flakes. Briefly saute until soft, add zoodles (2 zucchini) and sprinkle with s&p. Continue to cook until zoodles are al dente, then stir in some fresh basil leaves. The combination is delicious! I used a batch as a topping for pizza and it was the best veg pizza I'd ever made (no pizza sauce). Thanks Lisa for this timely post! I just got a counter top spiralizer and am eager to try it out. The small hand held one was tiresome, but taught me that I'd like to further explore this trend. I'm looking forward to some yummy recipes from your readers! Debbie - I'd love it if you'd share some or even one of your curry recipes. Bad taste of protein powder in shakes even with fruit and veggies. How do I cover it up ? 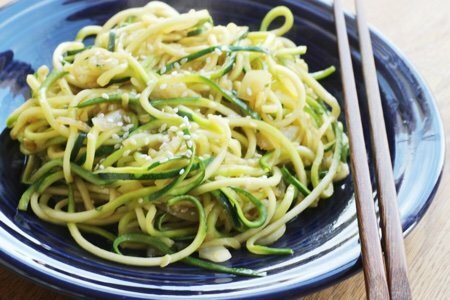 which spiralizer do you recommend? there are so many out there. Hi Beth, I could send you some recipes. I looked for my favorites and realized that they require quite a few spices and I am not sure if that interests you or not. So I have another recommendation so that you can try some of the recipes before you invest in the spices. I found these at Walmart and you can order them online as well. They are made by Passage Foods and called Indian Scratch Kits. They have dozens of flavors and they are only $2.50 each at Walmart. They include the spices, the meat marinade and the sauce. Some of my favorites are Chicken Tikka Masala, Butter Chicken, Moroccan Lemon Chicken. They have other cuisines too. I add onions, sweet peppers, sweet potatoes, white potatoes, to the dish and then serve over the zoodles. Very healthy. Also you can look for sauces in the Indian section of the nicer grocery stores. And if you still want some recipes, I will be more than happy to send you a couple of my favorites. There are thousands online too. Lisa, you are going to love beet noodles! Potatoes make some really nice noodles to sauté in EVOO! Thank you so much, Debbie! I shop at Walmart regularly but have never noticed these kits. I've got them on my list and can't wait to give them a try. Sound quick and easy - my kind of dish! Hi again Beth. I know you are going to love them. For what ever reason, they are not restocking them in my local Walmart. They used to be with the other Asian foods and then they moved them to an end cap. But I just placed an online Walmart order for all my favorites. My husband and I are trying to establish healthier meals, more veggies, less meat. I love my spiralizers. We have a small hand held model and a hand crank type which is greater for larger size vegetables. My quick weeknight stand-by is zucchini spiralized "noodles", sautéd with onions, mushrooms, some type of bell pepper (your color choice), matchstick or shredded carrots, chicken breast cut in bite sized pieces and sauted ahead or cooked shrimp; a jar of light Alfredo sauce (or make your own with Babybel soft garlic and herb cheese, with a dash of milk). Season with 1/4 tsp to 1/2 tsp garlic salt or powder, and a dash of Emeril's Southwest seasoning. Top with chopped green onion tops and freshly grated Parmesan cheese. 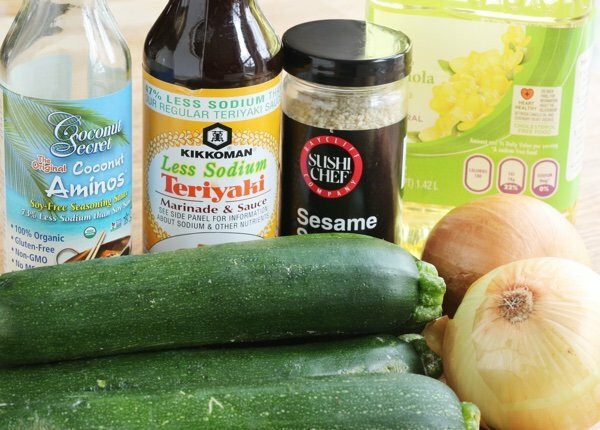 If we are craving pasta, I may cook 4-6 oz of low carb pasta and stir it in, otherwise just zucchini zoodles. If you eat mostly meatless dinners how do u make sure u get ur protein in a day?? Willie, you would be surprised to on how much protein broccoli and spinach have. Also if you eat beans and legumes they are full of protein. I make zoodles a lot but have yet to find a way to make them turn out less watery. I even squeeze them to death before cooking them. They always end up watering down my sauce, which isn't good for thin sauces such as lo mein sauce. I even serve them in a strainer over a bowl to let them drain but they still are watery. Any solutions? I spiralize beets for salads. Most people seldom eat raw beets but when you spiralize them they add natural sweetness and crunch to a sometimes boring salad.